Home / Blog / When should you sell a rental Property? Should you sell a Rental? You need to take a hard look at your rental property or portfolio and decide if it is meeting your objectives. Is the property you are thinking of selling meeting your objectives? Or are you loosing money on it. Will you continue to loose money or miss your target objectives or was their a one-off maintenance issue that killed your Return this year? Does the market still make sense? Is your rental in a linear cash flowing market or a cyclical market at its peak? In a linear market you don’t have to try as hard to ‘time the market’ as you would in a cyclical market where you want to sell when the market it peaking or increasing. What is the value of the property compared to what you own on the property? (Loan to Value?) Can you get another loan with a better interest rate (time to re-fi?) on this property or on the next one? If you won’t qualify for a new loan, keep this financing in place as that loan is a great asset. Does your current rental fit with your current plans? We suggest planning your goals and reviewing them at least annually. Is the rental still a part of your current or long term plans? If rentals are still part of your plan and it is fully depreciated a 1031 exchange would make sense. 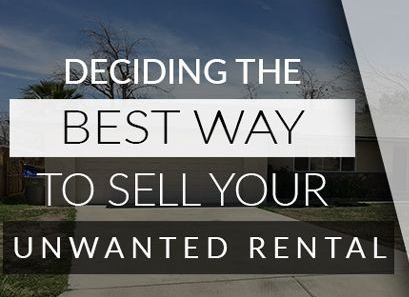 However, if the rental no longer fits into your plan you should consider selling it. Is your plan to own one rental, 10 rentals, or 100 rentals? If you have a large amount of equity built up in one property it may make sense to sell and leverage your equity among other rentals. This will need to be part of a plan with your lender and CPA and you should discuss this with them. Does your plan still make sense to you? If not you should revise it and adjust your portfolio accordingly. That may mean selling one rental and putting the money into the purchase of several others. Or it could be selling the rental and using the cash for yourself. If you do decide to sell regardless of how you purchased the property you need to review Step 1. If the property is in a nicer area with a strong owner occupant resident base, using a realtor may make the most sense. If the property is currently rented, working with an experienced investor can be your easiest sale. Or if the property is in an area with a large tenant resident base as opposed to owner occupants you are likely going to be selling to another investor. Working with House Sold Easy can make the entire process simple. You will pay no fees as we pay cash and can close quickly even on properties with tenants in place. We Buy Houses in all areas of St. Louis and St. Louis County including : Affton, Arnold, Ballwin, BlackJack, Brentwood, Bridgeton, Central West End, Chesterfield, Clayton, Crestwood, Creve Coeur, Des Peres, Eureka, Ellisville, Ferguson, Florissant, Glendale, Hazelwood, Jefferson County, Kirkwood, Ladue, Lemay, Manchester, Maplewood, Maryland Heights, North County, O’Fallon, Olivette, Overland, Richmond Heights, Rock Hill, Sappington, South County, South City, St. Ann, St. Charles, St. Charles County, St. Peters, University City, Valley Park, Webster Groves, Wildwood, Winchester, West County and more!